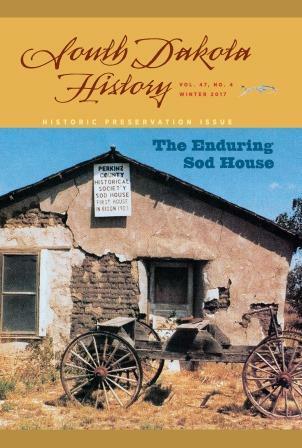 Houses, barns and other buildings made of sod are the focus of the Winter 2017 historic preservation issue of “South Dakota History,” the quarterly journal of the South Dakota State Historical Society. “It’s Weathered Many a Storm: The Enduring Sod House in Northwestern South Dakota” by Molly P. Rozum details the role of sod structures in the settlement of the region. Though most sod buildings survive only in memory, three remaining houses in or near Bison are highlighted: the Collis and Minnie Penor house, the Anna M. Carr house and the O.F. and Molly Dragoo house, all constructed by homesteaders between 1907 and 1910. Rozum’s research also includes photographs and personal interviews with those who built, occupied or recall additional “soddies” in the area. Rozum, a native of Mitchell, S.D., earned her master’s in American folklore and her doctorate in United States history from the University of North Carolina at Chapel Hill. She is an associate professor and Ronald R. Nelson Chair of Great Plains and South Dakota history at the University of South Dakota in Vermillion. The issue also features a tribute to historian, educator and author James D. McLaird by Amy Novak, president of Dakota Wesleyan University in Mitchell. A professor emeritus at Dakota Wesleyan, McLaird died in August 2017. He was a member of the editorial board of “South Dakota History” and contributed numerous articles over the years. McLaird also wrote “Hugh Glass: Grizzly Survivor” and “Wild Bill Hickok and Calamity Jane: Deadwood Legends,” both published by the South Dakota Historical Society Press.